The ability to function depends largely on the ability to sit and stand in ways which do not stress the body. Unfortunately, too many chairs in too many offices do not adequately and correctly support the people who sit in them, leading to lost time, low morale, and long-term harm. QOR360, a Burlington, Vt. startup, works to change that dynamic with its line of ergonomic chairs. Their latest entry, the Newton, is a top-notch addition to this space, and everyone who must sit for a living will welcome it. The Newton chair provides an excellent platform for active sitting and has an adjustable seat height based on its two sizes. The small chair has a range of 17” to 21”, while the large chair has a range of 20” to 27”. The chair allows a full range of movement—forward, backward, and side-to-side. It appears to be a simple seat which is perched on top of a platform. It requires a small amount of balance. The two are connected by QOR360’s “Eccentric Bicylinder,” which allows a full range of rocking motion. The soft pad is removable. The chair comes with a traditional five-spoke base allowing it to be fixed in place or on wheels. The Newton chair is attractive, compact and easy to set up. It will blend into most modern office spaces nicely and is small enough to be stowed or moved as needed. It should fit under most desks. QOR360 notes that most people need a bit of time to get used to active sitting. For most people, however, that time is short. In fact, I took to it immediately. Top of the line office chairs are $900 and up. The Newton is better, and you can almost buy four of them for that price. The Newton is priced at $275 direct from QOR360. The Newton is top of the line engineering for active sitting—at a budget price. In short, I love this chair. My productivity is increased by multiples when using the Newton. I can highly recommend this American-made chair. QOR360 was founded by Dr. Turner Osler, a trauma surgeon and research epidemiologist at the University of Vermont Medical Center. Dr. Osler notes on the company website that he had “suffered from a tyranny of conventional chairs” throughout his lifetime. It led him to discover active sitting and to invent the Eccentric Bicylinder, which looks awkward but works beautifully. The company is based in Burlington, Vermont, and is proud to source most of its materials in that state. The QOR360 team is committed to manufacturing in the U.S. The company sells five other chairs and one portable seat. The chairs range in price from $225 to $450. 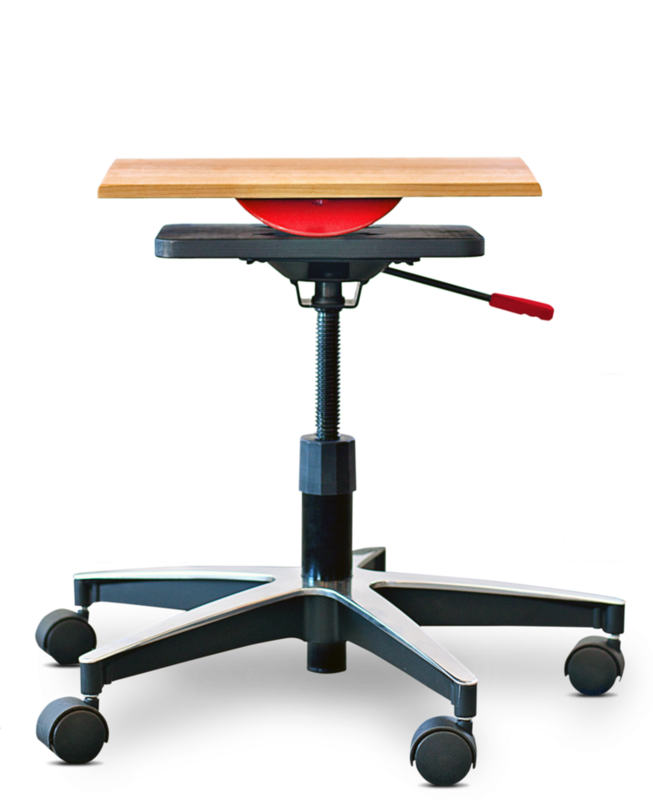 The portable seat, which is simply their seat with no legs of any kind, can be placed on any surface to obtain the benefits of active sitting. The company offers a two-week money back guarantee on all its products and a three-year warranty. Dr. Osler and his team have designed their chairs drawing on many disciplines. Yoga and aikido underlie some of the design decisions alternating movement, stillness, and providing balance. Perhaps the best way to describe active sitting (or “dynamic sitting”) is to point to the exercise ball. When you sit on an exercise ball, you continually move to keep your balance, and this is the same concept. In any chair designed for active sitting, the body will naturally align to provide proper posture and balance. Your core muscles will continuously make fine adjustments to preserve posture and balance. Because you’re always moving, you will be expending calories. This additional calorie burn throughout the day will help in weight control and conditioning. Also, the motion can boost core muscle strength and may help preserve low-back health and may help improve overall mood. Because the body is in motion, the muscles remain alert. On rising after a prolonged sitting, active sitting practitioners may find much less need to stretch before walking. Active sitting also seems to increase alertness and focus, both in the classroom and office. Humans are not creatures meant to “sit still”—we perform better when we can be in motion. Studies of children with ADHD find that providing them with active sitting accommodations allows them to stay on-task much more readily. Yoga and active sitting are closely related. Exercise balls are sometimes called “yoga balls” for a reason. The intentional use of a ball, which has the natural inclination to roll, to sit still provides the body with the benefits of active sitting. It must work to remain in place. The Feldenkrais method has also been an inspiration. Feldenkrais emphasizes that posture is not static. Gravity, after all, is the constant in our lives. The Feldenkrais method stresses intentional effortless movement and adjustment, so that much of our balance and posture becomes automatic and unconscious. These methods are also reminiscent of Taijiquan (or “tai chi”). The martial art focuses on the development of slow, controlled movements which, when used rapidly, can deliver tremendous force. The movements are repeatedly practiced. They become part of muscle memory so the practitioner can access them as needed. These methods of muscle training all apply to active sitting. If you are an active sitter, your body is continually adjusting to the pull of gravity. You should not have to think about the movements at all, and certainly not after you get used to the chair. As you may guess, the Newton provides all the benefits of active sitting. In fact, no other active sitting chair comes close to the engineering and comfort of the Newton. Posture is the arrangement of body parts in relation to each other. We continuously arrange our body parts as they all deal with gravity. We learn posture from a very early age, as we learn to roll over, crawl, attempt to stand, stand, and then walk. As we move about, we are continually adjusting our bodies to gravity and our surroundings. When we are not attentive, we can trip and fall. But if we have good, practiced balance, we can prevent the fall and quickly recover our balance, even if the trip over a crack in the sidewalk was unavoidable. Posture while sitting is also essential. Slumping into seats, or not taking a properly balanced seating posture, can lead to back problems and other health concerns. Good posture helps us channel the pull of gravity through our body. Good posture has many benefits, including balance, muscle strength, and internal organ functions. Good posture allows better and deeper breathing, as well as improved digestion and circulation. Muscles and joints are more relaxed and freer to function. Since we all have a touch of vanity, good posture also can make us look thinner and younger. In part, that appearance comes from the increased air of confidence we exude when we have good posture. Finally, good posture helps control what could be called the curse of walking on two feet—the bad back. Proper posture while standing will ensure we don’t stress and strain our spines. I found the Newton chair from QOR360 to be the most comfortable active sitting chair I have ever tested. It has a sleek design, and the materials are of excellent quality. The design and engineering of the Newton are the best I’ve seen in an active sitting chair. I could keep my feet flat on the floor while using it and realized my posture naturally found its sweet spot. I was comfortable and at ease. The range of movement is complete on the Newton Chair, and despite what you might think from the appearance of the Eccentric Bicylinder, you feel safe and secure on the chair. Sitting on the Newton feels completely natural—and it provides the benefits of active sitting at the same time. I found there was no learning curve to using it. It is easy to sit on and felt like a natural way to sit right from the start. The ability to rock back and forth is especially important when music is playing. I’m able to move to the music and keep on working as I do. The biggest testimonial I can give to the chair is that it is now my primary chair—I use it daily and find I can focus and work better while using it. Unlike other active sitting chairs, the Newton does not tire you out. I can use it all day long.